At 4am I was wide awake, our dog as cute as he is, howls every time an emergency vehicle siren can be heard in our bedroom where he sleeps at the foot of the beed. Friday nights are busy days for emergency vehicles in the city. Went back to sleep and then was awaken by the wife who figured I should be getting ready, it was 7:00am. I got to Crissy Field, the place I though we were starting from at 8:50, however that was the finish location for the Populaire but the start was at the Golden Gate Bridge. Oh well, another 5 minutes and I was at the Bridge while Rob H. our RBA was finishing his usual pre-ride speech. John was volunteering at the start of the Populaire. Once all Populaire riders left it was our time to go. Rob, John P. and I were doing the PRLH 200k Volunteer ride. We were supposed to start with the Populaire riders at 8:00 but there were some minor things both Rob and John had to take care before we could leave, we started at 8:15-ish. We rode together to Sausalito and then at the bottom of the Camino Alto hill they both rode ahead. I was not in the mood to ride fast, as usual I set on a steady pace. 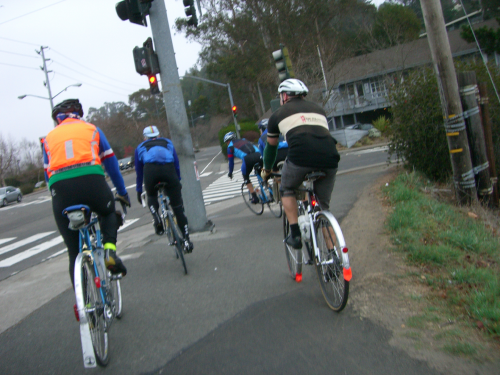 By the time I got to San Anselmo I had catch up a group of riders, John among them. Kept my pace and when we reached White's Hill it was just John and I. He went ahead again and I decided to stop at the top to turn off phone and save the battery just in case. The solo miles went by fast. I caught up with more Populaire riders and found myself alone once more once I turned left into Bear Valley Rd. It was overcast and almost at this point it was hard to tell if it was going to rain or not, so far we have had just intermittent light mist. At Inverness Park I fet like stopping to have an Ensure, that turned out to be a good idea. The 350 calories provided by the nasty liquid would help me deal with what was ahead. At the top of the Inverness hill I rejoined John; a very light but steady rain forced us to stop and put our jackets on. Ah crap my front light bracket was loose. I guess I messed up the adjustment last week when I decided to touch what was not broken. "Go ahead John, I'll fix this and try to catch up later" John moved on. My hands were cold and wet and readjusting the light bracket took me what it seemed forever but once it was done I was back on business and riding at my pace. There is an advantage to riding alone, there is no pressure to keep up or to slow down. I also enjoy riding with other but I don't mind solitude. After some miles I could see John ahead. 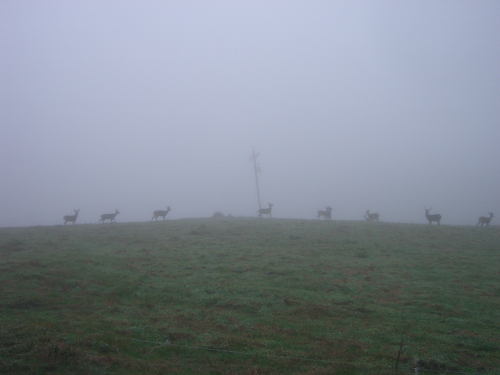 I got to his side, chatted a little and then went ahead, into the heavy mist. My socks were soaked by now and my feet very cold. The rest of my body was very comfortable. Once I got near the few last cattle guards before the Lighthouse Rob was already on the return leg. We stopped and chatted for a while; John showed up a little later. Yep we agreed we were not to crazy about the rain but it was not horrible either, we all have seen worse. A couple of hills before the lighthouse and then I was outside the restroom taking my gloves and socks off and squeezing a decent amount of water out of them. John came and left while I was doing my hands/feet maintenance. Again I would catch up with him and ride together for a little while. When I got to the top of the inverness ridge it was barely raining so I decided to stop and take off the rain jacket and have another Ensure. John went by and again I caught up with him near Inverness. I was not tired and the mild temperature helped me maintain a good mood. Near Point Reyes Station I could see John not too for behind but I was almost sure he was gonna stop at Black Mountain Cycles for a visit and I did not wanted stop there as I knew it would be a long stop. I moved on alone. 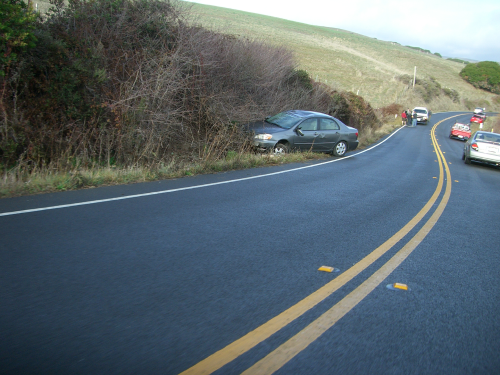 A few miles out of Point Reyes Station there was an overturned car. The car went into the opposite side of the road embankment probably took the turn too fast, overcorrected and put the tires against the sky. It had just happened and now friends of the teenage driver where gathering and jiggling. Was I like that when I was their age? Back then I did not think so but I am sure to older eyes I was. No blood, just damage to the kid's ego, I moved into the headwind to Marshall. A few of mies before Marshall we cross paths again with Rob. He was now on the return leg to the city. I calculated he was 40 or so minutes ahead of me. At Marshall I got a root beer a juice that disappear in no time. Another Ensure for the way home. The total stop was about 10-15 minutes, a long one for what it was. Saw John on his way to Marshall a mile or 2 after I started moving towards San Francisco. The sun was out and now I had a lovely tailwind. Now I could hear some weird noise coming from the drivetrain and it was getting worse as miles went on. I could not tell what it was. Stopped to check things but nothing looked wrong. It most have been related to the rain, who knows. 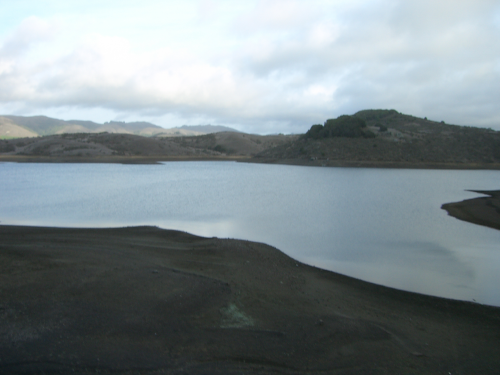 While riding through Nicasio I pulled a 5-hour energy drink from the backpack and drank it in one sip. It actually tasted good. The bike noise was on my head and going up Camino Alto I was wondering if I was going to have to finish the ride on foot pushing the bike but everything held up and I finish a little after 6:10pm, just under 10 hours. A slowish time (for me) but not bad considering all the stops and the rain and wind. I could not feel my left foot toes till I got into the shower. Time for some food.